It is not certain whether Gerard came from present-day Italy or France. He went to Jerusalem and there, towards the end of the eleventh century, he established a hospice for pilgrims and the sick next to the Church of St. John. 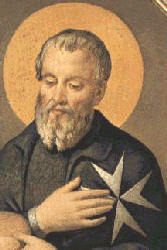 To maintain this work he founded a religious community, which he governed in accordance with the Rule of St. Augustine. On 15 February 1113, Pope Paschal II solemnly approved the new Order, which had been established even before the first Crusaders went to Palestine to recover the Holy Sepulchre. The Pope's Letters Apostolic, Piae postulatio voluntatis, were addressed to 'Gerard, Founder and Warden of the hospice at Jerusalem and to his lawful successors.' Gerard died at Jerusalem in 1120.